I jsut wanted to say this post came at just the right time. I just got off the phone with my friend who said she was thinking on going to the court and getting officially married the day before her wedding and then having a ceremony which would be presided over by a friend with whom they are very close to. I told her i thought it was a fabulous idea. I see your point, and it's been suggested to me before-- it's quite expensive to get a licensed celebrant in Western Australia (although it's not all that much cheaper to get it done at the registry-- over $300!). I don't know why, but for me, it's important that my wedding is actually when I get married. Otherwise it seems like play-acting. I want my family and friends there when it happens, to laugh and cry with me. I agree that the "play acting" thing feels weird. But in some states, it's play acting even with an official person. That's because the license has to be mailed into the state for the marriage to be official. Besides, for me, marriage doesn't happen the moment the state sanctions it. From my perspective, it's actually something that builds over a long period of time. And then the most official moment is when I declare that commitment publicly in front of my family and friends. I disagree about play acting. For most of us, the legality of the marriage is technically confirmed before or after the ceremony anyway, whether it's when the officiant signs the license, when the state notarizes it, or whatever, and that a ceremony is an entirely different thing in its entirety. In fact, I'm having trouble even connecting the ceremony to the legal steps mentally. that's pretty much what we're doing. the province of quebec imposes all manner of hassle on weddings -- licensed celebrant, must include specific legal language, must take place in a sufficiently solemn, public location, must be announced in an approved manner for 3 weeks in advance, every week (the banns of marriage). crazy! 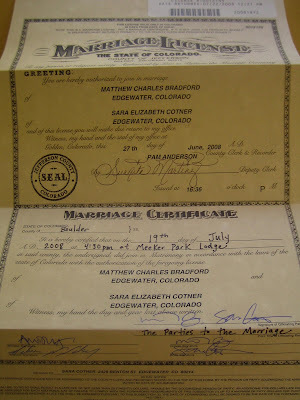 even though we have a licensed celebrant (ordained family friend), i didn't want babble from the code of family law in our ceremony, and the location where we both want to get married is private property. solution: pay an extra $80 or so (on top of the $200 it would cost to get the license and marry on our own) to do a courthouse marriage. we will have our real wedding on saturday in the presence of our friends and family.